A Northwestern fencer toes the strip. Various Wildcats will be up against stiff competition in the Junior Olympics this weekend. Following their first week off since the beginning of Winter Quarter, six Northwestern fencers return to action this weekend in Memphis as the Wildcats look to turn the Blues City purple. Freshman sabre Alexis Browne, sophomore foil Alexandra Banin, sophomore epee Pauline Hamilton, freshman epee Anya Harkness, freshman sabre Jacqueline Hua and sophomore foil Amy Jia will all be fencing at the Memphis Cook Convention Center for the 2018 Junior Olympic Fencing Championship. All six fencers have winning records on the year, with Hamilton and Banin leading the way with over 45 wins each this season. To qualify for the Junior Olympics, which is only for American fencers, the athletes must have been born between 1998 and 2004 and meet certain points requirements or finish at a certain level in a qualifying event. Five NU fencers participated in last year’s Junior Olympics: Banin, sophomore epee Adelle Berdichevsky, Hamilton, Jia and sophomore sabre Abby Tartell. Hamilton went 6-0 during pool play and was the No. 3 seed in the junior epee tournament before being upset in the round of 64. Jia was the highest placed finisher as she finished in No. 32 out of 213 competitors. Harkness also competed in the event in 2017 representing her club team from California and tied for No. 173 out of 208 fencers competing in the junior women’s epee event. Those six fencers are not the only Cats competing on a big stage this weekend. Freshman foil Sarah Filby and freshman epee Marta Amador Molina will both be competing at international events. Filby is competing for Canada at a World Cup event in Mödling, Austria and Molina will represent Spain at the Tournoi de la ville de Dijon in Dijon, France. 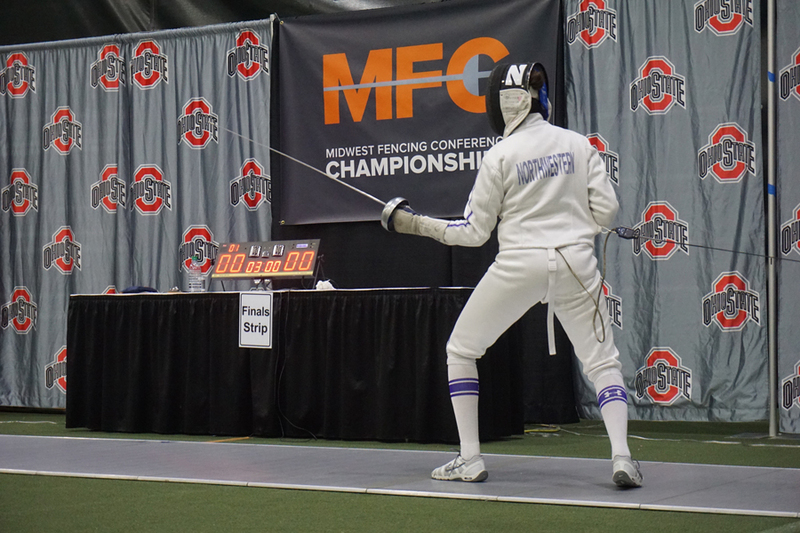 While the Junior Olympics are a big event for the individuals going, a much greater competition is looming in the near future: the Midwest Fencing Conference championships. The conference championships will be held next weekend in Columbus, Ohio, and the team has gone all-in preparing for the event. As a result, the Junior Olympics is not the main focus in practice. One of the biggest things NU has been able to do during the past week is rest. This past weekend was the only weekend the whole team had off since the beginning of January. Moss said having a week, or two for the 21 fencers not fencing this weekend, of rest following such an exhausting stretch during the middle of midterm season is very important to the team’s psyche.